When are we open? | ¿Cuando estamos abiertos? FAQ is an acronym for "frequently asked questions." Q: What kind of people will I encounter at Circus? A: Our customer base consists mainly of Americans. The mixture of consists of Americans of Asian, European, African, Central and/or South American ancestry. I don't know if we have had any Australian or Polar Americans, but since we don't ask, we really don't know. Q: Do you think you're being funny? A: Pretty much ... yes! We know that having your vehicle damaged can put people in a bad mood, but if you look at our prices, can you really keep a straight face? 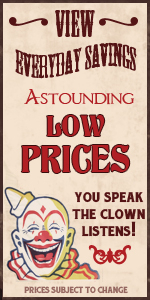 I mean, our prices are so low they are actually funny! A: For starters, you will need to bring your own tools. The parts don't jump off the vehicles, so without tools you would have a difficult time. Wear or bring clothes that can get dirty, and especially bring a positive attitude. Q: What is CORE and why is there a price for one? A: Core is the industry term for "exchange old junk part". That junk part does still have some small value. Bring it back! We return the core deposit and then we will process the part to complete the recycling process. Q: When I called, the person that answered the phone was unsure if you have the part I need. What's up with that? A: We don't inventory the parts on the cars. If you check out our Inventory page you can see if a car is in the facility, but since people are pulling parts off cars all the time, we cannot be sure if the part we just saw in the morning is still on the vehicle in the afternoon. Q: What forms of payment will you accept? A: Cash! We always love cash. However, we also accept Visa and Mastercard ... We DO NOT ACCEPT LINK. Q: I don't know what the gimmick is, so I will just ask, "What is the real price of the engines?" And our Governor says the State of Illinois wants you to pay sales tax on all purchases.